Announcement Spring is around the corner! Time to add a fresh snuggle!! What are you going to send to that new "little one" in your life !? Welcome expecting moms, I know first hand this is not easy!! Please browse and enjoy, send me any questions you may have. Spring is around the corner! Time to add a fresh snuggle!! Tribal Baby Woodland Nursery Bedding, tribal baby shower, tribal baby blanket, tribal fox. Pick your trim color. Feather print Blanket, Painted feather blanket. Aqua chenille back with embroidered detail edge. unisex throw. 42x72 inches. Girls Hedgehog flower blanket, stroller blanket, Flower blanket, 32"x 42", Garden flowers, woodland critters. 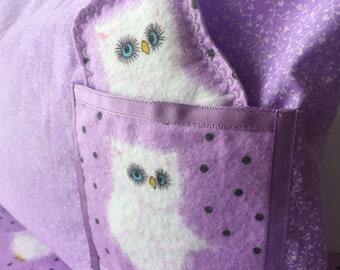 Girls burp cloth, lavender and white, embroidered edge detail,cotton and flannel,coordinating blanket and lovey available. 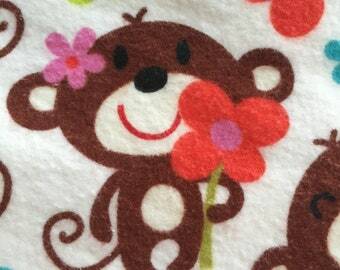 Girls Flower Monkey stroller blanket, monkey nursery, monkey blanket, monkey birthday gift, monkey nursery gift., 28"x 42"
Gender Neutral Reversible Kids blanket, Gender Neutral Kids Bedding, Large kids flannel blanket, 42 x60 blankets, Modern Stripe Monkey . Fashionista Blanket . Pink zebra blanket. Valentines gift . Mothers Day Gift, Pink Zebra Stripes . 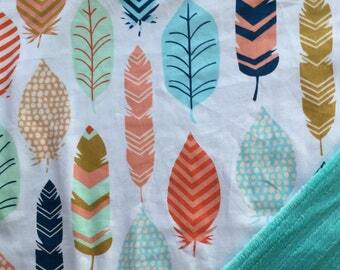 Reversible cotton and flannel . This Paddington Bear blanket is exactly as pictured and was quickly shipped! This is an EXCELLENT seller! Paddington Bear stroller blanket, throw blanket, baby shower, Paddington nursery, play mat. Thank you so much for all your help! The blanket was so cute and shipping was extreme fast! Seller even offered to help find extra material for a coordinating project! Couldn’t be more pleased! Thanks again!! The blanket is lovely, a great weight for summer when used alone but will also keep tiny toes toasty warm when layered against a northern winter's night. Shipped quickly, and just as described. Thank you for a beautiful product. Boys Choo choo train blanket, train nursery, train decor , train baby shower, 42x65 inches, double flannel blanket. Last minute not so spooky fox. 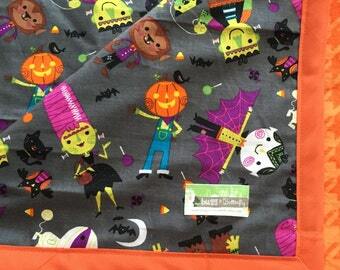 Not so scary Halloween stroller blanket. halloween blanket. Halloween throw.halloween baby, Cute halloween blanket. Halloween Baby shower. 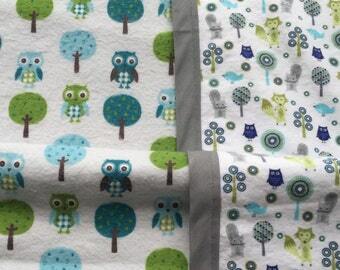 Unisex baby jungle theme nursery bedding, unisex baby zoo theme nursery bedding, jungle theme blanket, zoo theme blanket, baby zoo decor. Anything is possible ....even a Dalmatian reindeer !! Hand embroidery ? YES !!! "Momma, is the moon out yet ?" I hand select individual fabrics, 99% of the time only to make a one of a kind blanket, so if you see something you like don't wait long because there is not another to be found!! My business began like so many ,I couldn't find what I wanted, a blanket long enough for my son to sleep with that covered him for the night. He is a HOT, wrestless sleeper so the footed PJ's only lasted for awhile, making the average size crib blanket useless (36x40) , and him uncovered. I wanted a blanket that was warm and yet could be added as a layer if needed. I also didn't want it bulky to make his convertible crib bed. (3 sided daybed). I knew cotton flannel is light but warm and so very soft. Think of your favorite flannel shirt. I left it unlined and trimmed in bias tape for durability and color. The size is perfect in length that it easily tucks under the foot of the mattress while also covering the mattress sides WITHOUT having to tuck them in. The cotton flannel will shrink as it does if it were a flannel shirt, but after many, many washes and dry's the size remains large enough to still cover the sides and long in length. As for the tag line...every night my son says to me " Momma, is the moon out yet?" ( time for bed and book with his favorite blanket) It is the best part of my day and I think his too ! My mother taught me to sew at a very young age, my grandmother taught me to crochet and for twelve years I followed my passion in Interior Design. 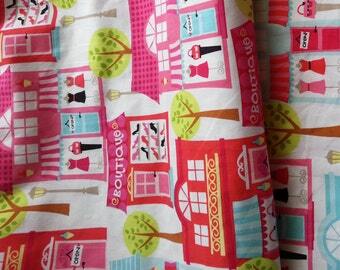 Now I live my fabric passion everyday ! Life is Good! Thank you for Shopping with Bugg and Butterfly. 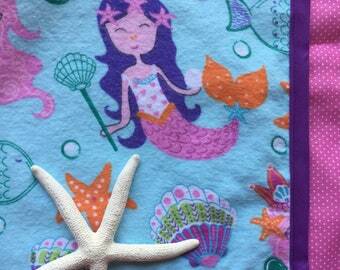 Fabrics are a passion of mine since I was young and have been sewing since the age of 10. I take great pride and care in producing my products to make sure each product is of high quality and unique . 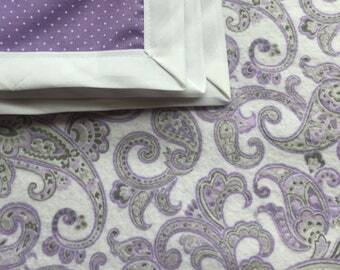 All of my fabrics are selected by me and rarely available a second time because I do not buy the bolt, so don't wait long!! I like producing ONE OF A KIND items so each is very special. I believe each blanket is a great start to gain a direction for a new room or a beautiful addition to your little ones room for a final touch. I welcome you to convo me with any questions you may have. Please leave me your comments about your favorite finds and suggestions of what you would like to see !! If you have any concern with your purchase please contact me in an Etsy convo so I have the chance to amend the issue. I want you to be happy with your purchase and experience .I strive to present my product in a accurate manner. I take great care and pride in producing a high quality product and want you to be happy. Please contact me within 10 days of shipping to notify me of any issue. I do my best to ensure that my product arrives to you in the same condition as it left my home. If a claim needs to be submitted please let me know upon its arrival. REFUNDS: will NOT include the shipping charges, only the product price and will be issued after product is received back to me. The return is at the cost of the buyer and must include a tracking number to be shared with me . A refund will not be honored past 30 days from shipping unless a prior conversation has taken place. PLEASE NOTE: SHRINKAGE IS A CHARACTERISTIC OF COTTON FLANNEL AND IS NOT CONSIDERED A FLAW OR POOR QUALITY AND CANNOT BE RETURNED FOR THIS REASON. I accept Major Credit Cards, PayPal and Etsy Gift Cards. Canadian residents are responsible for paying any additional taxes or fees imposed by their country. If paying with a CREDIT CARD using Etsy direct pay your item will ship to the address provided at checkout. UNABLE TO CANCEL AFTER ITEM SHIPS. ALL CANADIAN ORDERS - PURCHASER IS RESPONSIBLE FOR ANY AND ALL TAXES AND FEES IMPOSED BY THEIR COUNTRY. If you are purchasing more than one item please message me so I can give you accurate shipping price. I will try and condense any packing I can to keep postage low. Your Item will ship when payment is verified received. Once your item has shipped you will receive a notice with a tracking number and your order is no longer cancellable. If this is a GIFT and you would like it sent to the recipient I would be happy to do so, please leave a comment of a couple of lines you would like written in notes with name and address. Must be in U.S. only. If paying with a credit card using Etsy direct pay your item will ship you provide at checkout. Do you own a BRICK AND MORTOR STORE? I have experience in providing my goods for consignment . This past season I was very successful in a shop called LITTLE LUXURIES ARTIST MARKET located on Makinac Island , Michigan . All products on my page are complete and ready to ship unless otherwise noted. I do my best to supply accurate color photos but monitors all read differently. To this, I usually have very small scrap of fabric if you need a swatch to confirm color. Convo me to request a sample if needed. 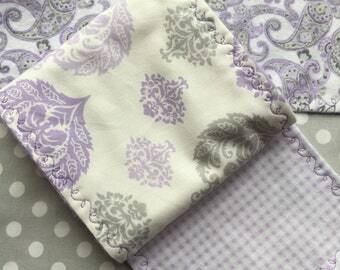 In the future I will be offering Certified Organic fabric and it will have its own section on my page. Do you have more of this fabric? All of my items arrive wrapped in tissue, and placed in a drawstring muslin bag ready for gift giving. The bag is hand stamped with the Bugg and Butterfly logo and name. The bag is exceptionally useful when laundering a stuffed animal or stethoscope cover to help care for these special items and for storing and preserving your blanket for years to come to be handed down to the next generation.